Texas Rangers Cards: 2014 in review - First Base. Time to continue the 2014 season in review by moving down to first base. First base was even a bigger carousel than catcher for the Rangers in 2014. Nothing is more indicative of this than the fact that Prince Fielder's 39 games at the position were enough to qualify him as the most-used first baseman on the team. After Fielder left the stage with season-ending neck surgery, the ride started. It included appearances by Mitch Moreland, Brad Snyder, Carlos Pena, Mike Carp, Ryan Rua, J.P. Arencibia, and Adam Rosales. Snyder and Pena are no longer with the team. Since neither made any significant impact I am going to take a pass on examining their seasons. 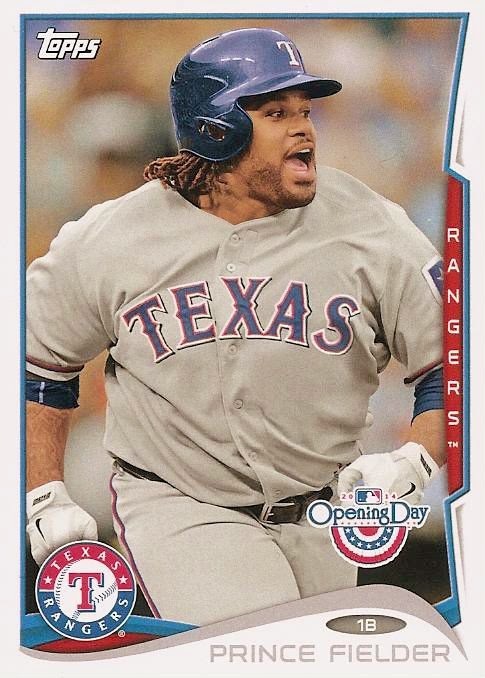 Prince Fielder, shown here on card 132 in the 2014 Topps Opening Day set, came to Texas in the Ian Kinsler trade during the off-season. Fans and management alike held high hopes for the established slugger. Didn't take long to determine something was wrong. In 42 games, Fielder hit an un-Prince like .247 with a dismal .360 slugging percentage. The three long balls indicated a problem. There was one and Fielder underwent season-ending neck surgery to repair a herniated disc. That gave Mitch Moreland a chance to re-claim his former role as the everyday first baseman. Mitch had been relegated to a Designated Hitter role with Fielder's arrival in town. Mitch made 184 plate appearances over 54 games before his season ended with ankle reconstruction surgery. He put together a .246 batting average with a .297 on-base percentage. He also hit nine doubles, one triple, and two home runs. In 22 games at first he compiled a .989 fielding percentage in 193.2 innings. That's just under the league average. Following Moreland's surgery, the madness really began with various players tried here and there. None seemed to be a long-term solution. Snyder and Pena were first and hardly hung around long enough to make any noise. Mike Carp's defense was below average but acceptable over the 79.2 innings he played first. Mike's problem was his bat. In his time with the Rangers, Carp came up to the plate 46 times and batted just .125. His on-base percentage was .217 with no extra base hits. He got designated for assignment on August 31st and finished the year in the minors. Adam Rosales started the season as a utility infielder but ended it by playing first base every day. He batted .262 over 181 plate appearances in 56 games. He also tallied a .328 on-base percentage but didn't hit for much power with a slugging percentage of just .378. Seven doubles and four home runs. Adam was the second most used player at first base with 252 innings played there over 32 games. His above average defense was a pleasant surprise coming from a player who hasn't regularly played first in the past. J.P. Arencibia moved over to first after he lost out on the catching job. He ended up playing just as many games at first base as he did behind the plate. His offensive struggles were outlined previously. In the 22 games he played at first he logged 179.1 innings in the field and compiled a .987 fielding percentage. That's five points below the league average but it must be kept in mind that Arencibia has never played first base in his professional career and was trying to learn the position on the fly. Ryan Rua did his part to fill the breach by playing 77 flawless innings in nine games. Since he is primarily an outfielder his offensive production will be covered in that post. If everything goes according to plan, the Rangers will see Prince Fielder back at first base in 2015. For him to regain something close to his old form and reliability would be the best scenario. Mitch Moreland could fill in from time to time if needed and serve as a DH some of the rest of the time. Barring more disasters, I don't see Mike Carp returning to Arlington. Adam Rosales will likely be in Spring Training with a chance to make the team as a utility player. Arencibia might polish his skills at first over the off-season to increase his versatility and value. It might get him a second look if the competition behind the plate is intense. Ryan Rua will be looking to make the team as an outfielder and is likely hoping his time at first base is in the past.